Tomato paste is a thick, rich, concentrated reduction of tomatoes (Solanum lycopersicum) made by cooking then straining the tomatoes of all skin and seeds. Unlike other food products that lose their nutritive value when processed, tomatoes retain theirs. Tomato paste not only keeps most of the nutrients found in the actual fruit, but it becomes even more beneficial in other ways. 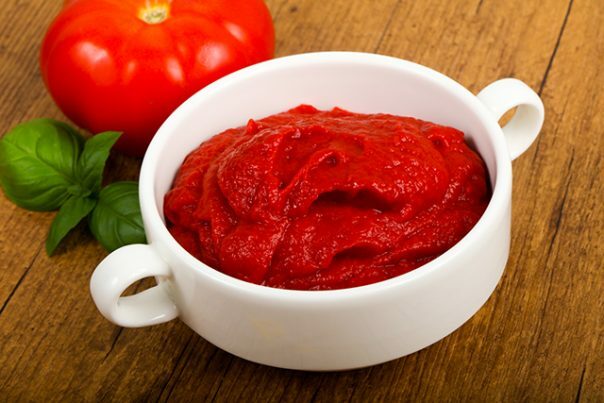 Because it’s been exposed to heat, tomato paste is able to better release lycopene. This potent antioxidant is know to be good for the eyes, brain, heart, and bones, and is most abundant in tomatoes. In fact, the bright red coloring of tomatoes is due to their rich lycopene content. Tomato paste is no different, with a single teaspoon containing 4.6 mg of lycopene. One other antioxidant, or antioxidant-acting vitamin in this case, found in tomato paste is vitamin C. That same single teaspoon of tomato paste can deliver 3.5 mg of this important vitamin. Frequent consumption of tomato paste can prevent hypertension. The carotenoids, a family of plant pigments which lycopene belongs to, have been noted for their ability to reduce the oxidation of low-density lipoprotein (LDL) or bad cholesterol. This prevents blockages from occurring within the blood vessels, thereby lowering the risk of high blood pressure. Despite this, tomato paste from cans can be harmful to those already suffering from hypertension due to the high amounts of sodium. Tomato paste may play a role in lowering the risk of asthma thanks to lycopene. This antioxidant is believed to inhibit the response of inflammatory cytokines in the lungs, as well as the number of white blood cells associated with asthmatic immune response. As a result, this greatly reduces the chances of developing asthma. When eaten alongside a small serving of olive oil, tomato paste was found to minimize sunburn, or erythema, by a considerable margin. Tomato paste by itself was found to be just as effective at protecting the skin against the flushing that proceeds ultraviolet light exposure. Due to the variety of nutrients, tomato paste can promote a healthy heart, lungs, and skin. Moreover, tomato paste is naturally low in calories and cholesterol, and is therefore safe for the body overall. Tomato paste is available in cans and tubes, but concerns have been raised on the possible detrimental health effects of canning. Those who wish to avoid the potential dangers of canned tomato paste can easily make their own at home. Homemade tomato paste requires a fair amount of effort and time, but it’s far healthier than the store-bought variety. The easiest way to enjoy tomato paste is on pasta with a simple tomato sauce. Though according to Niki Achitoff-Gray of SeriousEats.com, there are many different ways to make the most of tomato paste, which range from enriching stews and braises to naturally adding color to food. Tomato paste is a healthy ingredient that can be called such because it retains most of the important nutrients of fresh tomatoes. It can prevent hypertension, asthma, and sunburn, and as such, is good for the heart, lungs, and skin. However, canned tomato paste is loaded with sugar and sodium and may yield more harmful effects than benefits.